The Broil King Regal 490 Pro is basically the same as the Imperial 490, except this gas grill has porcelain coated cast iron cooking grates instead of stainless steel rod, and the side burner is capped with brass instead of stainless steel. This is a 4-burner gas grill with side and rotisserie (not infrared) burners with a fully enclosed cabinet and plenty of grilling space. The main burners are Broil King's dual tube which means even heating and the heat output is high so you get a powerful grill that does a great job. Broil King redesigned the Regal series grills to make them more attractive and give them a more modern feel. The 490 Pro is the top of the Regal line and comes clad in stainless steel. Other Regals are painted steel and if stainless isn't a big deal for you, you might want to look at the other Regal models to save some money. 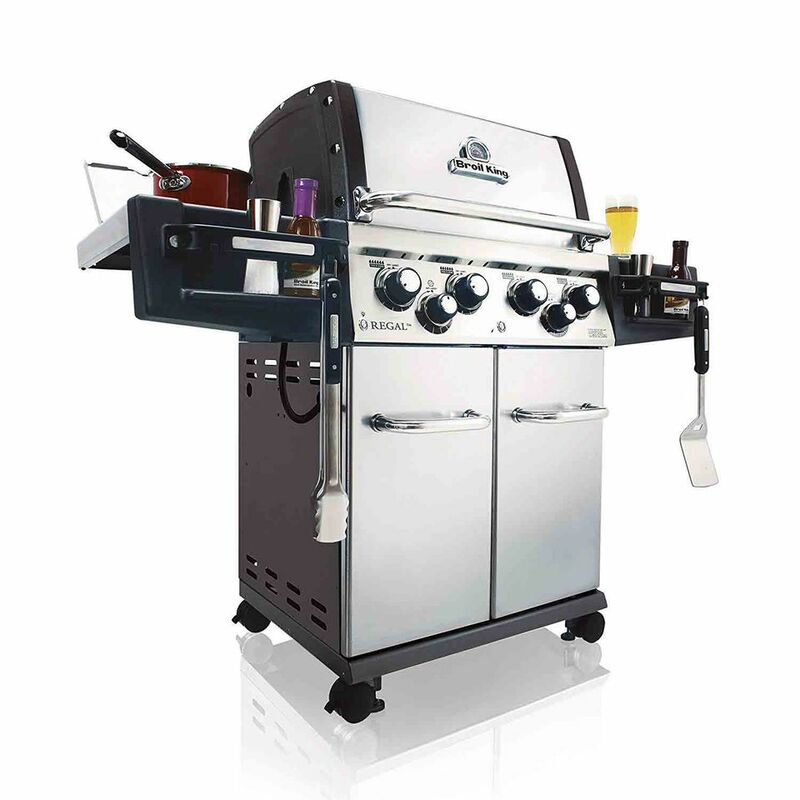 The two features that stand out on this grill are the dual-tube stainless steel burners and the linear flow control valves. The dual-tube burners equalize the gas pressure inside the burner so that the heat is even front to back. Standard tubular burners tend to have higher pressure in the front of the burner and can give you uneven heating. The Broil King burners correct this problem. The control valves on this grill have an even, highly precise flow that gives you a very high level of heat control. Add in the four-burner design and this grill will let you pick an exact temperature from the very high to the very low. This grill features a full rotisserie system that includes a standard (not infrared) rear mounted burner. This burner works as well as most any infrared rotisserie burner but has the durability of a high-quality stainless steel burner. There is also a brass capped side burner on the left side table under a flush mounted cover. This burner is a little low on the BTUs so it won't quickly heat up a large pot but it is powerful enough to heat a small skillet or saucepan. This grill has great construction and should last for many years. Broil King is known for making superior grills and this one is a good value. What Is an Affordable, Reliable Char-Griller Gas/Charcoal Grill?